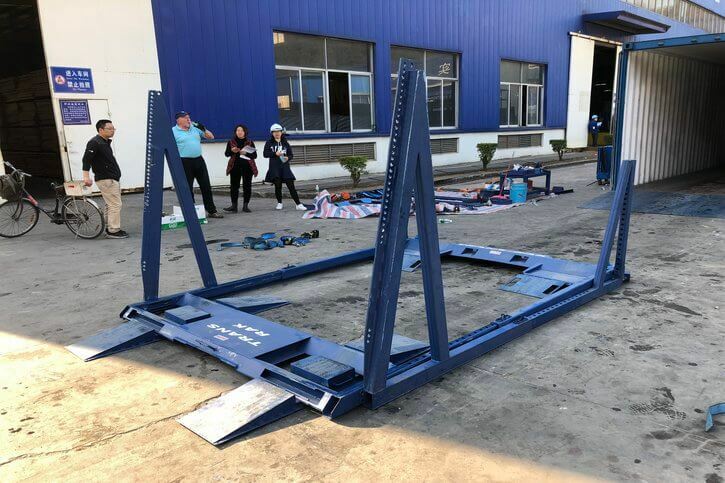 The EL-RAK is the latest product from Trans-Rak and allows for vehicles of any shape or size to be loaded and secured outside the container. 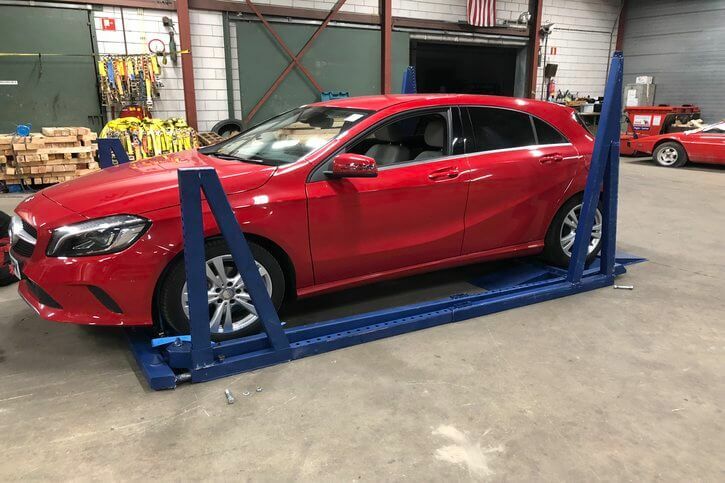 We have taken the successful philosophy of the R-RAK and used our expertise to expand into the external loading market. 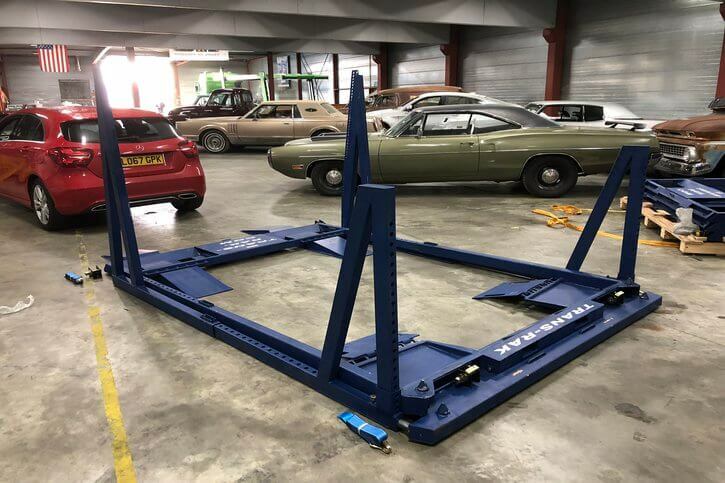 The EL-RAK is an innovative container racking system that allows cars to be loaded externally on wheeled cassettes, and then moved into place by forklift truck. Using an EL-RAK allows operators to securely load 3 to 4 cars in a 40 foot shipping container. 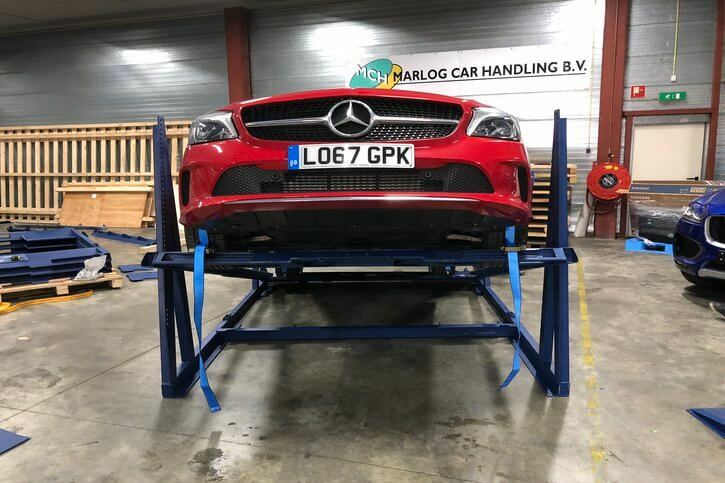 The EL-RAK differs from our other solutions by allowing drivers to position their cars on the racking before being placed in the container. When collapsed, the EL-RAK pod will load up to 45 pods inside one 40ftHC container. This efficiency minimises repositioning costs for the operator. How does the EL-RAK offer a superior alternative to its competitors? The main difference is in the size and shape of the EL-RAK’s top and bottom cassettes. 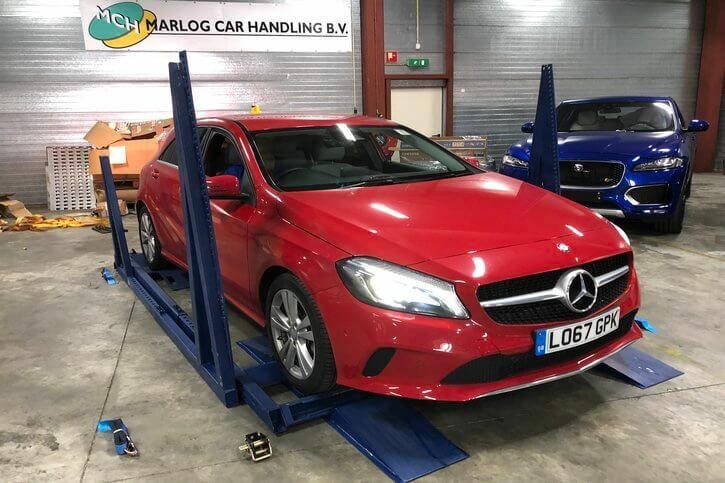 On competing systems, these are of different parts, restricting the carrying capacity of a container when shipping a mixed consignment of vehicles and making equipment relocation extremely difficult. On the EL-RAK both cassettes are the same; giving you greater flexibility for transporting different numbers and sizes of vehicles. To put it simply, the EL-RAK can load 4 small vehicles on a route in one direction and then the same equipment can be used to load 3 larger vehicles on the return leg of the journey. The EL-RAK is also universally adaptable to any size shipping container. The racking can easily be adjusted to accommodate 45 or 53 foot shipping containers, standard height, high cube or super cube containers and standard width or pallet wide boxes. All without any risk as the vehicles are completely secured. 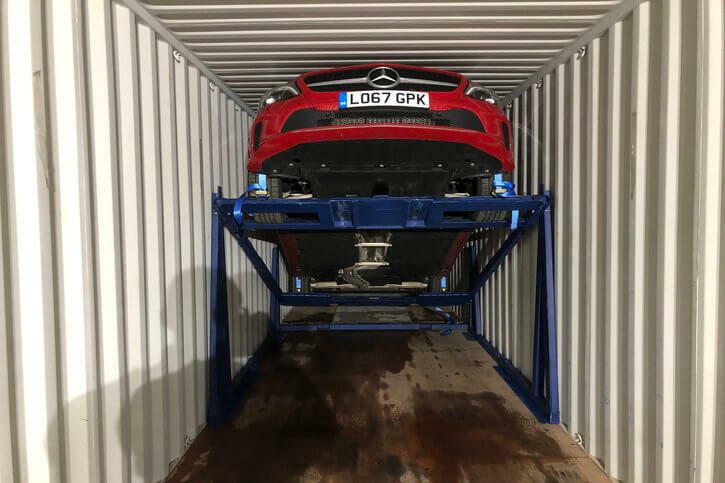 When loading the upper vehicles, the racking is moved into the container horizontally, rather than at an angle, and is only lifted to the transport position once inside the container. 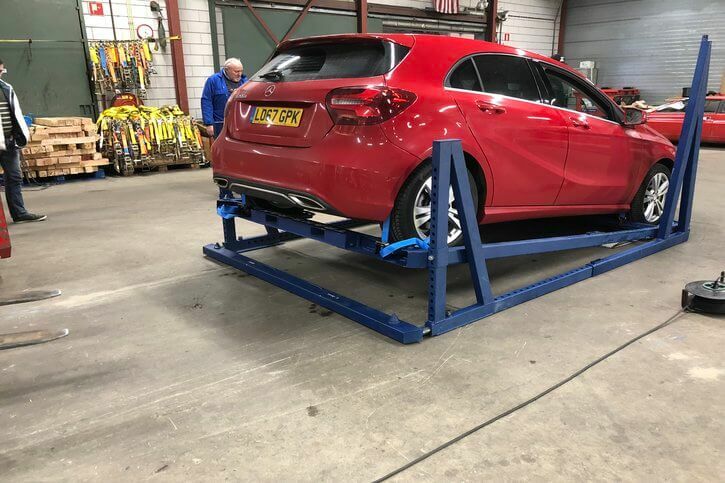 This maximises space utilisation by ensuring that vehicles are lifted as high as they can be inside the container, rather than being limited by the lower height of the header bar at the door of the container. Once again, this helps you maximise load efficiency, streamline planning, and minimise the risk of damage. 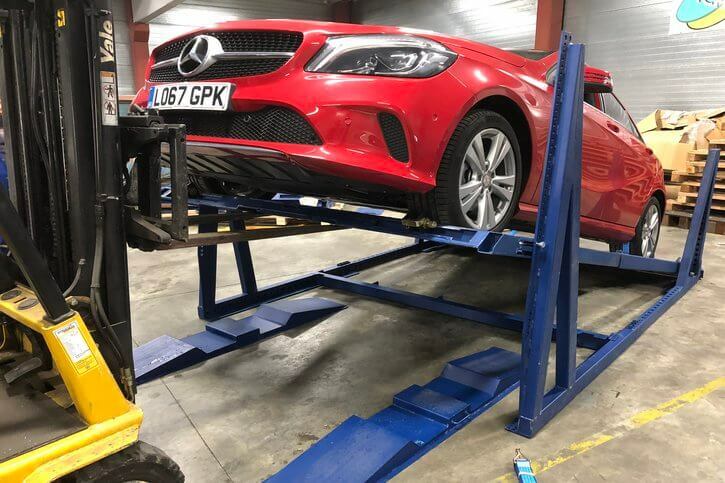 Competitors have to fit already lifted vehicles under the bar shown in the picture, leading to wasted space at the top of the container, which means the lower cars can’t nest as far underneath, therefore reducing the number of cars that can fit in one container. To discuss the most appropriate solution for your business, please get in touch for a chat with one of our logistics experts today. Call us on +44(0) 1926 40 82 82, or send a message through our contact form. The EL-RAK offers unparalleled loading flexibility. Because the upper and lower vehicles use common parts, the same equipment is required for any loading configuration. Loading 1 raised and 2 floor vehicles, or 2 raised and 1 floor vehicle, or 2 raised and 2 floor vehicles uses the same 2 parts – cassettes and bases. 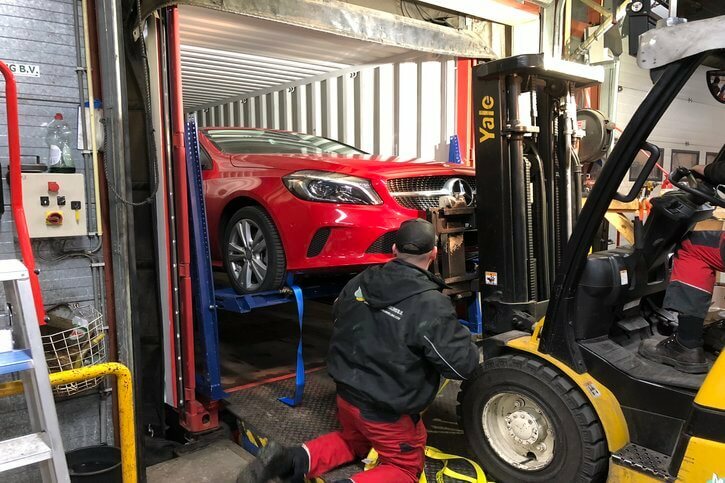 Whether you’re loading sports cars, SUVS, sedans, pickups or any combination of those, in 20ft, 40ft, 45ft or 53ft containers, it’s the same product. 1: Use a forklift to move an EL-RAK pod (pictured) around. 2: Take the base and assemble it as shown. 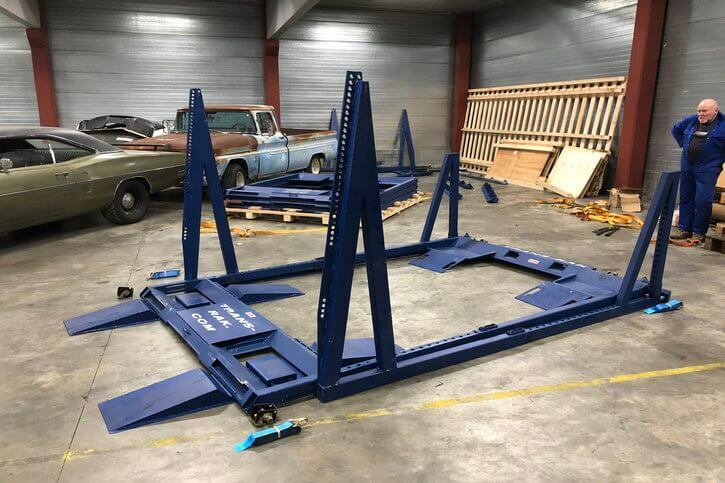 The posts are secured in the vertical position and the distance between the front and rear posts is adjusted to the size of vehicle being transported. 3: Take the cassette and adjust its length to match the wheelbase of the vehicle being transported. 4: Use a forklift to hook the cassette onto the base. 5: Position loading ramps so that driving the vehicle onto the assembly is easy. 6: Drive the vehicle onto the EL-RAK. Vehicle is then lashed over all four wheels onto the EL-RAK. 7: Lift the rear of the cassette with the forklift and secure it in position using bolts. 8: Use the forklift to roll the EL-RAK into the container. 9: Push in until EL-RAK reaches the prepositioned chock. 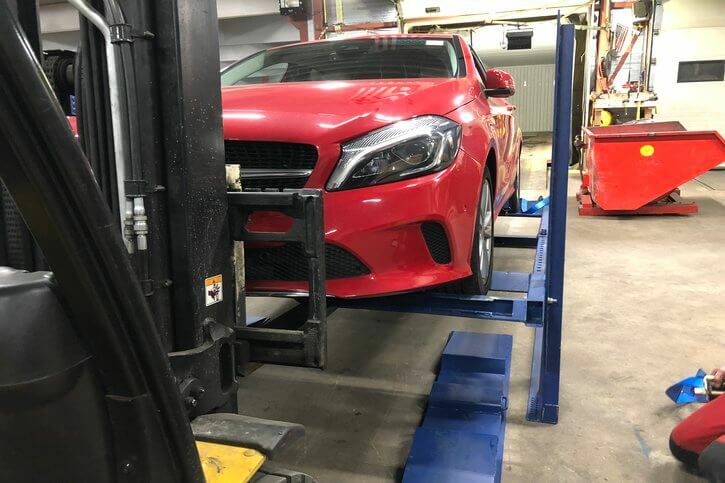 10: Lift the front of the vehicle until it is at transport height. Clearances to container wall and ceiling are at least 80mm. 11: Secure the front of the cassette to the base using bolts, remove the forklift and secure the base to the container floor using screws. 12: Position cassette and loading ramps for the floor vehicle. 13: Drive the floor vehicle onto the EL-RAK cassette and lash all four wheels using overwheel lashings. 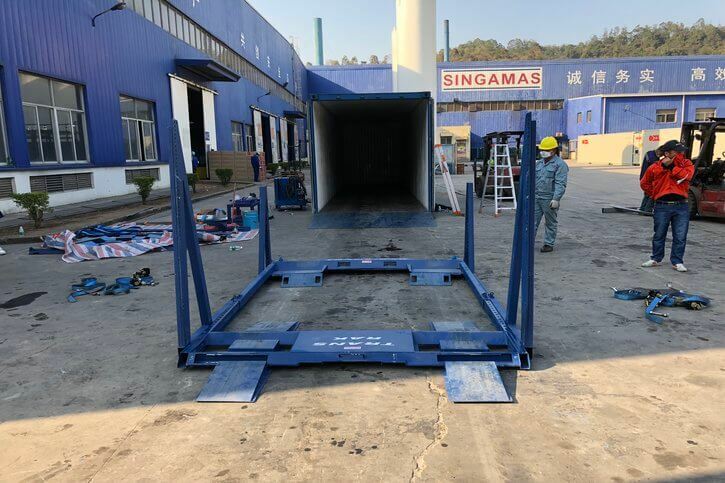 14: Use the forklift to roll the EL-RAK into the container. 15: Push in until EL-RAK reaches the prepositioned chock. 16: Remove the forklift. The distance between any vehicle body and any part of the EL-RAK is over 80mm. 17: Screw the cassette into the container floor using screws. 18: Repeat with third/fourth vehicle.